Tuskegee gives up yardage but not points. Over 25,000 people crammed into ASU stadium to witness the reboot of the Golden Tigers vs Hornets rivalry after a five-year hiatus. 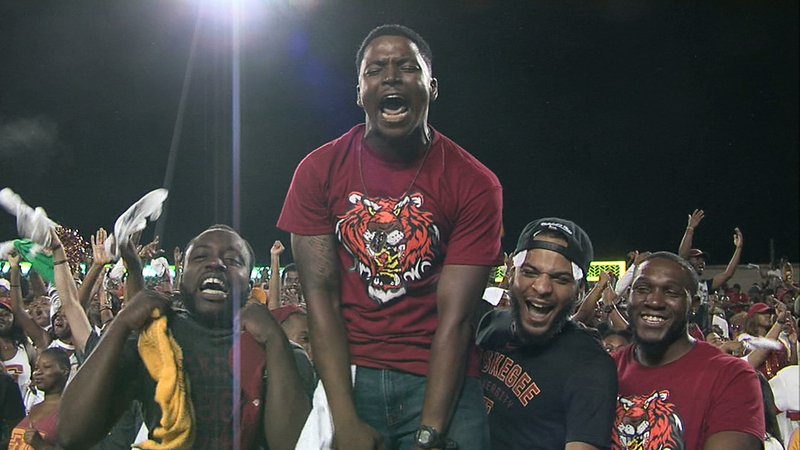 Alabama State fans might have been satisfied with the 400 yards of offense that the home team put on the stat sheet, but the Tuskegee faithful took more delight in the final score. A 14-6 Tuskegee win. Tuskegee gave up yardage on 90 percent of the field Saturday, but inside the ten-yard line, they managed to frustrate the Hornets all night long. In the opening period, Alabama State missed a field goal after reaching the seven-yard line with 4:44 to go in the quarter. The Golden Tigers missed a field goal of their own in the second quarter and it was close to being a shutout on both sides heading into halftime. With 1:28 to play in the half though, Jamarcus Ezell threw a 55-yard laser to Peyton Ramzy as he got behind the defense for a 7-0 lead. Tuskegee (1-0) made it a two-touchdown lead with 10:57 to go in the fourth after Darryl Pearson’s pass was picked off by Jonah McCutcheon and returned 46 yards for a touchdown. Alabama State got on the board with a three-yard touchdown catch by Alex Anderson with 1:16 left in the game. However, the extra point was no good and the onside kick attempt failed. Alabama State (0-1) returns to action on Saturday with an FBS matchup against Troy. Tuskegee will face off against Albany State in the WhiteWater Classic in Phenix City, Alabama.